This map shows the land districts of the Kansas Pacific Railway Company that are for sale in Kansas and Colorado. They are advertised as farming and grazing lands. The text for the land advertisements in three languages: Swedish, German, and English. Harris, Abrams & Company, located in Lawrence, Kansas, were the general land agents for the Kansas Pacific Railway. 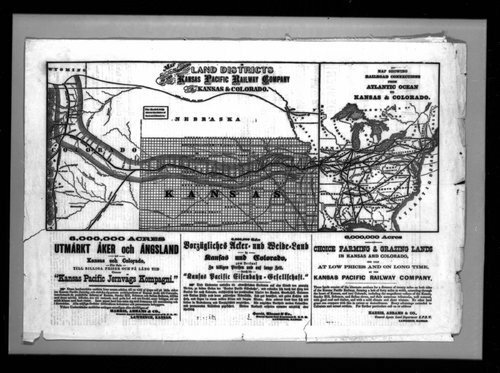 The map and advertisement appeared in the Kansas Pacific Homestead newspaper, which was published in Lawrence, Kansas.